The laws of geekdom state that a newer, shinier, more desirable gadget is always around the corner. And you usually want it. But do you have the bucks? Now, thanks to a slew of buyback programs and trade-in services, upgrading from last year's model doesn't have to sting. Sure, trading in used technology isn't as lucrative as selling it on eBay or Craigslist, but it's a lot less of a hassle. 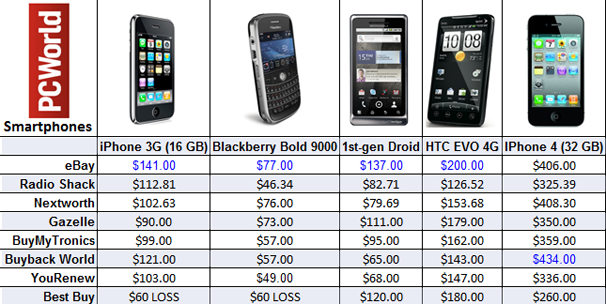 How the buyback services compared: smartphones. eBay's Instant Sale trade-in service offered the best prices, on average, for five popular smartphones, including an HTC Evo 4G ($200 in good condition) and a nearly three-year-old iPhone 3G 16GB ($141 in good condition). The site is free to use and offers free shipping and removal of personal data. If you're looking to trade in a phone--particularly an Android handset or iPhone--eBay is consistently the best deal. On the downside: eBay Instant Sale pays only through PayPal. Once you've committed to a trade-in, you have only ten days to ship the phone. Some competing services, such as Gazelle, honor their trade-in quotes for a month. Runner-up: BuyBackWorld had the best offer for a 32GB iPhone 4, at $434, beating eBay's quote of $406. Dishonorable mention: Best Buy's buyback program requires an up-front payment--$60 for smartphones--when you purchase the phone through the retailer. 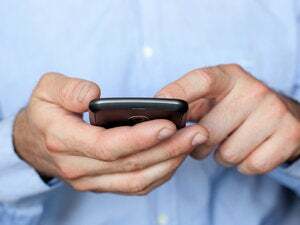 Best Buy doesn't say what the money is for, but unlike other trade-in services, it guarantees that it will pay a certain percentage of the purchase price of your phone, starting at 50 percent and decreasing incrementally over the next two years. But because wireless carriers lock most customers in with two-year contracts, the only way to get money back from Best Buy is to bail out early and pay a huge early termination fee. For example, trading in a 16GB iPhone 4 eight months after the date of purchase would put $220 in your pocket (40 percent of the unsubsidized $700 price, minus $60 for the program), but you'd have to pay AT&T $245 to get out of your contract. It's a lose-lose. How the buyback services compared: laptops. Instead of requiring you to pick from a dizzying list of model numbers, Gazelle's laptop trade-in service asks you to specify the brand name and then fill out the specs from a series of drop-down boxes. The process is more reliable than other services because you're choosing specs instead of looking for specific laptop models, and the process generally resulted in the best prices of the six competitors we surveyed that accept laptop trade-ins. Gazelle offers free shipping and pays by PayPal, check, Walmart Prepaid Visa, or Amazon gift card; it will donate your profit to charity if you specify that outcome. On the downside: Gazelle's fill-out-the-specs method doesn't treat solid-state drives as a feature to be considered, but neither does its competitor NextWorth, which takes a similar approach. Runner-up: eBay Instant Sale provides a reasonable alternative if you'd rather fill out a model number and pray that your computer is listed in the system database. Prices are decent. Dishonorable mention: RadioShack had a paltry list of acceptable laptops, and its trade-in prices were below average. Don't bother. 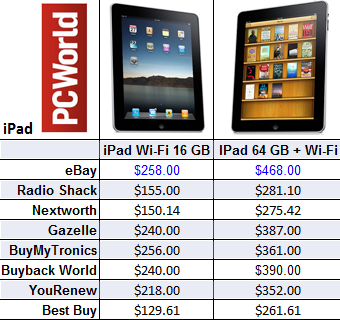 How the buyback services compared: first-generation iPad. Trade-in prices for the first-generation iPad dropped significantly after Apple announced a thinner, lighter, and faster model; only eBay Instant Sale is still willing to pay more than half of the iPad's original price. As of Monday, the site was paying $258 for a 16GB Wi-Fi model in good condition, and $468 for a 64GB 3G model. On the downside: The same two shortcomings associated with eBay Instant Sale's smartphone policy apply here: Payment is limited to Paypal, and the window for shipping your gear is brief. Runner-up: Keep an eye on BuyBackWorld. Before Apple introduced the iPad 2, this site was offering the best trade-in values on first-generation iPads, so it may be worth considering in the weeks before Apple launches the inevitable iPad 3. Dishonorable mention: Best Buy again. The program didn't exist when the iPad launched--but hypothetically, if you had purchased the $70 plan for a 64GB iPad 3G on launch day, you'd stand to make only 40 percent back now, or $261.61 after subtracting the up-front cost. How the buyback services compared: Kindles and Galaxy Tab. 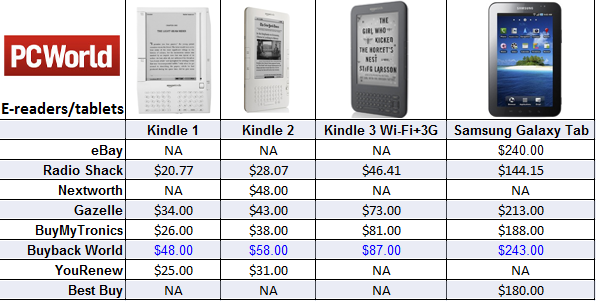 BuyBackWorld had the best trade-in prices on all three generations of Amazon's Kindle: Its buyback price for the current Kindle Wi-Fi plus 3G model is $87. Similarly, its $243 offer for Samsung's Galaxy Tab, while not a great value, is better than anything competing services have volunteered. Buyback World offers free shipping and pays by PayPal, check, or charitable donation. On the downside: Every time you visit BuyBackWorld's Website, a video of a woman waltzes onto the screen and starts telling you about the service. Few things are tackier than obnoxious, automatically playing audio. Runner-up: If the BuyBackWorld lady creeps you out too much, consider Gazelle, which offers decent prices for e-readers and tablets (and no talkative antelopes). Dishonorable mention: RadioShack offered the lowest trade-in values for Samsung's Galaxy Tab and for every generation of Kindle.